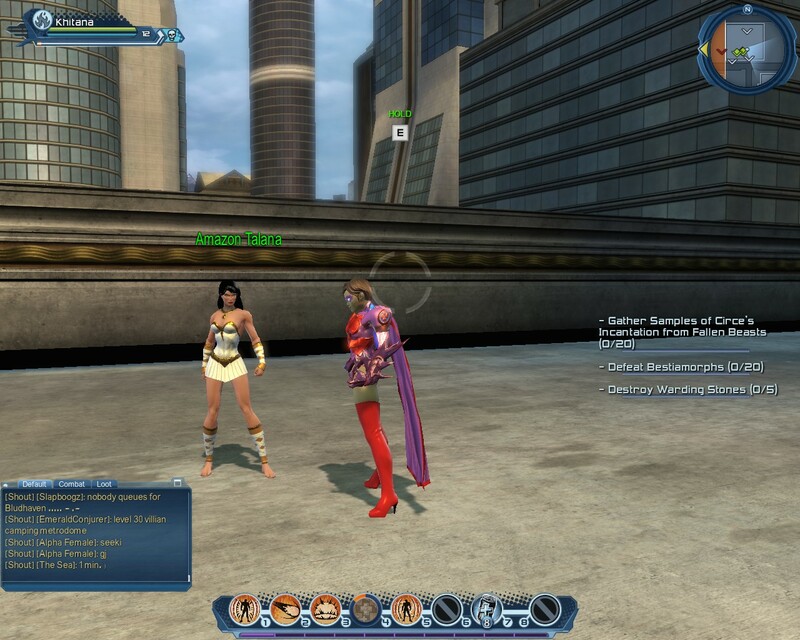 So, at a palate cleanser between bouts of Skyrim, I’ve been playing DC Universe Online. It’s goofy fun, and best of all it’s free. Basically you mess around in Gotham City and Metropolis, which are both huge cities; it’s always dark and gothic in Gotham, always sunny and futuristic in Metropolis. You are not the One Spoken of In The Prophecies; rather, to defeat an invasion by Brainiac, Lex Luthor has seeded the planet with thousands of new superheroes. The DC Universe honchos cheerfully serve as mentors for you, the fledgling hero or villain. You start by customizing your character. This mostly means choosing body type, skin, hair, and iconic colors; you’ll probably change the apperance of your gear (weapons and costume) as you get new items. Cleverly, though, you can lock in a choice… e.g. my hero always has those red thigh-high boots and no helmet, and my villain always wears her top hat. It’s an MMO, with all the pluses and minuses that come with the territory. People give you– and whoever else is at that level– tasks, which usually involve defeating n enemies. You just don’t think too hard about the fact that the enemies you defeat will respawn later. The game nicely hides this by giving you new, related quests, culminating in a boss fight in a separate arena. So at least it feels like you get closure on a quest. You can choose PvE or PvP worlds; I chose the latter because some friends were playing. This of course means that heroes and villains can attack each other… indeed, nothing prevents a max level player from beating up on newbies. This can be annoying if you’re trying to beat a quest; on the other hand it’s pretty satisfying to beat someone from the other faction. There’s a few other activities, such as timed acrobatics/flying challenges. One of the cute things about the game is that everyone is pretty much invulnerable to normal damage (e.g. falling), and can travel in one of three superpowered ways. The acrobatics one is fun as you can zip up the sides of buildings; flying is even better. There are a lot of nice touches– e.g. with acrobatics you can double-jump like a Scout, which if timed carefully lets you jump across a street. It’s most fun as a co-op game, though I recommend only doing this with an external voice server, such as Ventrilo. Some of the boss fights can be tricky and it’s better to bring a friend. The overall gameplay is pretty similar for heroes and villains. The morality of the game is… odd. E.g. as a villain you may be asked to help Lex Luthor infect innocent college students with a mutagen, or help Joker in a gang war. But the overall tone is that all this is kind of harmless naughtiness. Indeed, there are real villains, starting with Brainiac, plus a few renegades like Scarecrow… the bad guys go too far when they really want to destroy the world, or upset the balanced harmony of things. Telling point: the heroes’ safehouses are police stations, the villians’ are nightclubs. Whatever that contrast is, it’s not good vs. evil. You meet a number of famous characters, of course, though except in combat scenes it’s a bit disappointing to meet, say, Flash standing in front of a computer in a particular police station all day long. Naturally, the freeness extends only so far. There are premium options, but nothing really annoying. I.e. there’s no level cap for free play, and the premium players don’t get better gear. They get things like extra inventory slots, free DLC, more characters (you just get two for free). The only cap I’ve run into so far is that you can only accumulate $1500. Combat is fun, especially once you’re racked up a number of special skills and moves. Some of them use special mouse combos (the worst so far: mouse 1 tap tap tap hold tap) which I’m not good at remembering, but I’m learning. You don’t really aim– generally you hit the nearest enemy, though you can lock onto an enemy too. The skill comes in using your superpowers and skills wisely. Often you have to do a timed interaction with a defeated enemy (representing anything from stealing items to injecting something), and this adds some strategic finesse as you have to defeat nearby enemies first. The maps are well done– the entire cities are open, without loading screens, and huge, with extremely wide streets. It’d be nice if it were a little easier to get between the cities. I pre-ordered Arkham City, which I kind of envision as the same thing only serious.